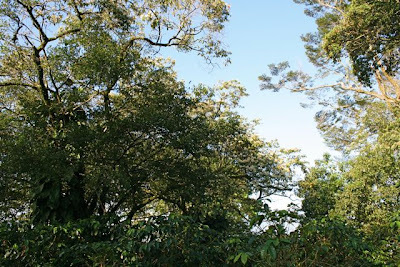 I'm sure most environmentally conscious readers have heard of shade-grown coffee; know it's better for birds and the environment. But I'd bet that not many of y'all have walked in a plantation. 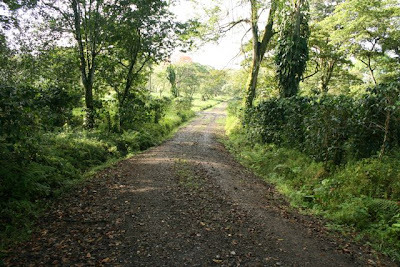 I'd like to take you along on my morning in a Honduran shade coffee plantation at Finca Las Glorias, near Lake Yojoa in Honduras. What fun it is to be able to do this! 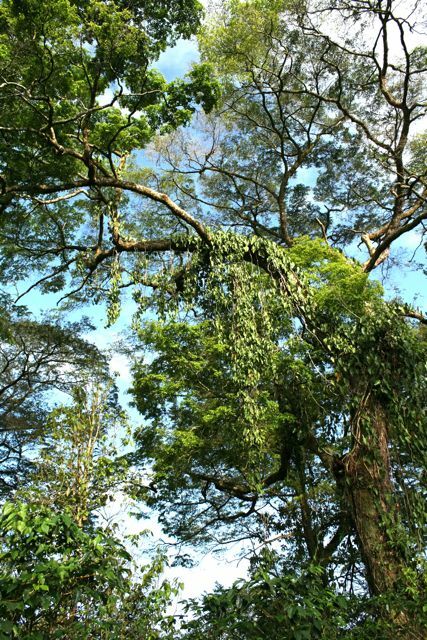 Coffee, a shiny-leaved tropical shrub, was originally a shade-tolerant plant. 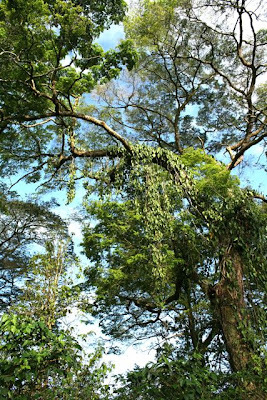 Artificial selection produced a sun-tolerant plant with higher yield, and the traditional method of growing coffee under an understory of native shade trees was largely abandoned in favor of widescale deforestation for sun coffee plantations. Oh, and heavy pesticide use, since the sun-grown coffee was thought to require that. 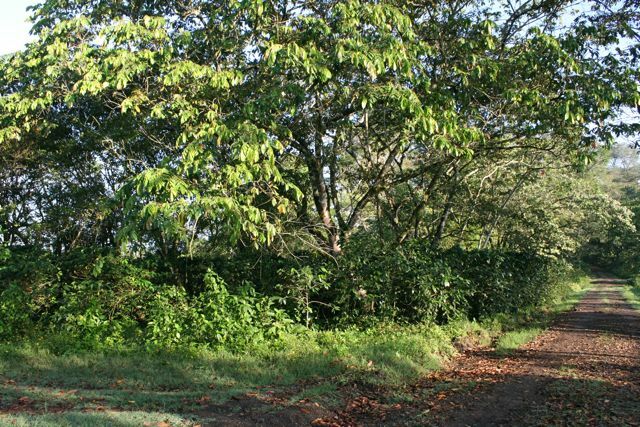 This was devastating to migratory and resident tropical birds, which had been happily foraging and living in shade coffee plantations all along. 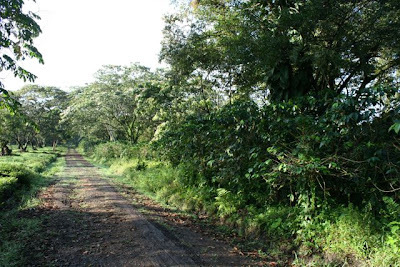 Migrants returning to their shady haunts were greeted with green ecological deserts of sun-grown coffee and nothing else. Does this look like a desert to you? Does it even look like a farm? Well, it doesn't to the birds, either. This is a shade coffee plantation and as a birdwatcher, I can attest it's a wonderful place to be. Look down, and there's a heavy understory of fruiting coffee. You can just make out the rows of coffee shrubs in this shot. Look at the size of those trees! 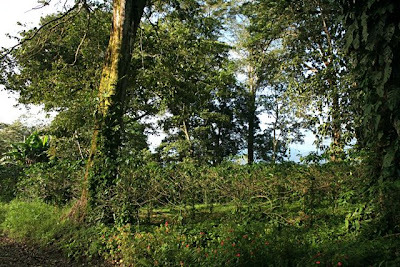 They were growing here originally when the understory was cleared and planted to shade coffee. This is one of the most enticing birding roads I've ever walked. and sweet North American migrants like this black-throated green warbler in the coffee underneath. They seemed to be asking me to tell everyone that shade-grown coffee isn't just a "green" catch phrase. It's the real deal. 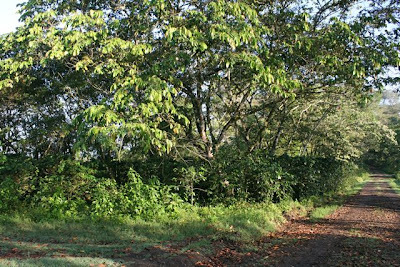 The plantations are useful--vital, even, to many North American migrants--orioles, tanager, warblers, gnatcatchers, vireos. I'm not sure why "our" birds use shade coffee plantations so heavily. 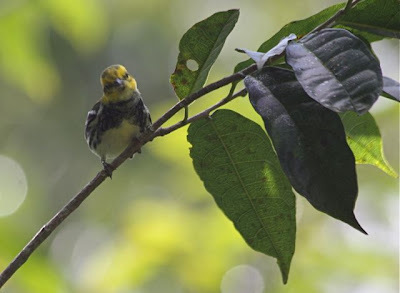 Sometimes I wonder if they have been forced into them by deforestation elsewhere, and being migrants, have to be more flexible in their habitat requirements than Neotropical resident birds. Which are also well-represented in the plantations. 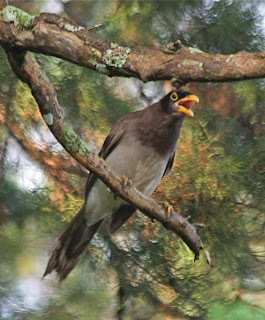 This fine brown jay screamed lustily, a percussive pow! in each call. It sounded like somebody was hitting him with a hammer, forcing the YEAH! out of him. A fine-looking giant cowbird, nest parasite of oropendolas. 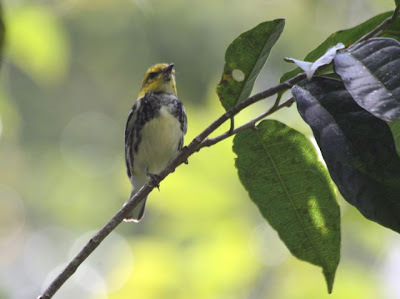 Get this: Neal G. Smith's 1968 study of giant cowbird parasitism on oropendolas showed that oropendola babies with baby giant cowbirds in the nest with them had better survivorship than those in unparasitized nests. Exactly the opposite of what you'd expect, with the cowbirds hogging the food and all... 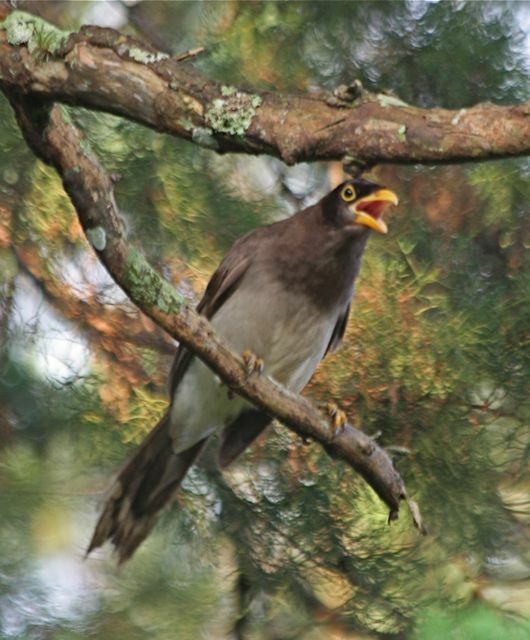 This was because the giant cowbird chicks are, for altricial birds, born quite a bit more with it than are oropendola chicks, and they are able to repel adult botflies and preen botfly larvae off themselves and the baby oropendolas, too. Botflies are true parasites, burrowing into the flesh of oropendola nestlings and weakening or killing them altogether. 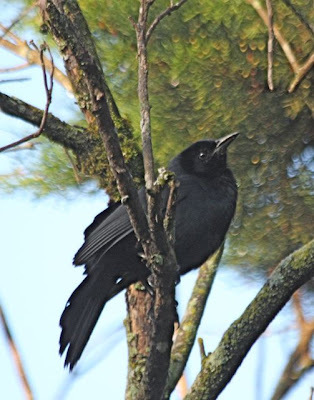 The snapping and preening behavior exhibited by giant cowbird chicks toward invading botflies and their larvae is unique among altricial passerine birds. But, like many stories of tropical biology, it gets weirder. Oropendolas that nest near colonies of social wasps and stingless bees get protection from botflies by some unknown mechanism. They don't need cowbirds in their nests. Oropendolas in those colonies are discriminators, and will toss out any egg that isn't identical to their own. So the cowbirds that attempt to parasitize those oropendolas nesting near wasps and bees have evolved eggs that closely mimic the oropendola eggs, and the female cowbirds that lay those mimetic eggs sneak around and lay them when the oropendolas aren't around. Female giant cowbirds parasitizing oropendolas that aren't protected by wasps and bees lay nonmimetic eggs, and they barge right in and lay those obviously different eggs in the oropendola nest after chasing off the rightful owner of the nest! These unprotected oropendolas don't discriminate, or throw out the eggs, even though they look different. And the cowbirds "thank" their hosts by leaving eggs that will hatch into babies that will preen the botfly larvae off the host's young. Having delightful trouble staying on topic. I never know what's going to come out of me in these posts. More shade coffee anon. Some of the parasites give even this SciFi monster fan the heebie jeebies. I shall try and afford shade coffee. The giant cowbird story is so neat! How do the two populations stay segregated such that these separate behaviours evolved? Obviously genetically-based, rather than learned, if it's the little nestlings doing it. How long till the two groups speciate, I wonder? I went to a shade grown coffee plantation while in Guatemala in January and until I read this had no idea how important that was. I thought they were all that way. Once again, I've learned something from you. Anything written by Neal Smith should be viewed with a great deal of caution. Much of his dissertation work was shown to be a fabrication, and there's no proof that he changed his ways later in life. The Giant Cowbird story is a great one, but when you read his original paper there are some disturbing inconsistencies.